Department of Microbiology 1, Department of Clinical Immunology 2, Sanjay Gandhi Post Graduate Institute of Medical Sciences, Lucknow - 226014, Uttar Pradesh, India. ABSTRACT: Japanese encephalitis is the most common arthropod-borne human encephalitis in the world. JEV clinical outcomes vary from complete recovery to recovery with neuropsychiatric sequelae to death. Contribution of T cells to the control and immunopathology of JEV infection has been reported in various studies. CD4+ T cells were found to be major T cells that has role in protection as well as affecting the clinical outcome in murine Japanese encephalitis model. Role of the CD4+ T cells subset in determining outcome of JEV infection is incompletely understood. Therefore, we sought to determine how quantitative difference in CD4+ T cell subsets influences JEV infection outcome. A total of 544 Acute Encephalitis Syndrome (AES) cases were admitted in ICU and AES ward of Kushinagar District Hospital during a period from Aug 2013 to Dec 2015. A diagnosis of JEV infection was based on clinical symptoms and anti-JEV IgM antibody in the acute phase cerebrospinal fluid (CSF) and serum samples measured by IgM antibody capture (MAC)-ELISA. Blood samples were drawn, and flow cytometry analysis was performed. The outcome was recorded as death, recovered, recovered with sequelae. Percentage of T cell subset CD3+ T cells, CD4+ IFNγ+ (Th1), CD4+ IL-4+ (Th2), CD4+ IL-17+ (Th17) and CD4+CD25high+Foxp3+ T reg cells were analyzed and compared between patients with different outcome. CD4+ Th1 percentage was found to be significantly in recovered patients when compared to other disease groups. A positive correlation was observed between GCS and Tregs cells (r=0.34 P=0.002). We conclude that CD4Th1 might be associated with recovery after JE infection. Treg cells expansion during JEV infection may lead to improvement in neurological manifestation. INTRODUCTION: Japanese encephalitis virus (JEV) is a small, enveloped, plus-strand RNA virus belonging to the family Flaviviridae and is the leading cause of viral encephalitis mostly in children of age <15 years, resulting in around 68,000 cases in Asia. Case fatality is found to be 20-30% of those affected, and 30-50% of the survivors have long-lasting neuropsychiatric sequelae 1. Most JEV infections are sub-clinical; only 1:250 to 1:1000 infected persons develop clinical presentations of acute encephalitis syndrome which may vary but include a headache, fever, a change in mental status (including symptoms such as confusion, disorientation, coma or inability to talk) and new onset of seizures, tremors, paresis (generalized) hypertonia and loss of coordination 2. While JEV infects and kills neurons directly in the central nervous system (CNS), CNS invasion of JEV causes the stimulation of microglia/glia and infiltrated leukocytes, leading to indirect neuronal killing via over secreting pro-inflammatory cytokines (such as IL-6 and TNF-α) and soluble mediators that can induce neuronal death. This notion implies that JE is an immunopathological disease caused by uncontrolled over activation of innate and adaptive immune cells, resulting in neurological disorders in the CNS. Therefore, excessive or inappropriate CNS infiltration and activation of peripheral leukocytes during JE can cause profound damage. Therefore, balanced CNS infiltration and activation of peripheral leukocytes should be achieved to have a favorable prognosis of JE without tissue injury 3. JEV clinical outcomes vary from complete recovery to recovery with neuropsychiatric sequelae to death. Production and trafficking of immune T cells potentially contribute to both recovery and immunopathogenesis 4. The role of the immune response to JEV in determining the outcome of infection is incompletely understood. Earlier studies show that increased protection was observed when JEV-primed isolated CD4+ T cells were transferred compared with isolated CD8+ T cells 5 moreover CD8+ T cells response does not markedly affect the outcome of the infection in a murine model of Japanese encephalitis 6. Therefore, we sought to determine whether JEV infection outcomes can be determined by quantitative differences in peripheral CD4+ T cells. Ethical Approval: The study was conducted after getting informed consent from the subject’s parents. Ethical approval was obtained from the Ethical Committee Bioethics Cell (IEC Code: 2013-104-EMP-73), Sanjay Gandhi Post Graduate Institute of Medical Sciences, Lucknow. Selection of Subjects during JE Infection Study: A total of 544 AES cases were admitted in ICU and AES ward of Kushinagar District hospital during a period from Aug 2013 to Dec 2015. These cases were investigated as per WHO case definition of AES. Clinically a case of AES is defined as fever or recent history of fever with a change in mental status (including confusion, disorientation, coma, or inability to talk) and new onset of seizures (excluding simple febrile seizures). Detailed history, physical examination, and relevant investigations were done by authorized medical practitioners. Glasgow coma scale (GCS), a scoring system based on the clinical status of patients was recorded by Medical practitioner and was used as a predictor of disease severity. GCS score less than equal to 8 considered as Severe, between 9-12 considered as moderate as and greater than 12 considered as mild. A diagnosis of JEV infection was based on clinical symptoms and anti-JEV IgM antibody in the acute phase cerebrospinal fluid (CSF) and serum samples measured by IgM antibody capture (MAC)-ELISA. Blood samples were drawn after written consent was obtained from each patient’s guardian. Flow Cytometry: For flow cytometry analysis of T cells following fluorescent monoclonal antibodies (mAbs) were used: anti-CD3PE, anti-CD4FITC, for surface staining. Treg analysis was performed as per manufacturer instruction using Treg staining kit (BD Biosciences) which include anti-CD4FITC, anti-CD25APC, anti-foxp3 PE mAbs. For intracellular staining, whole blood samples were initially stimulated overnight with JE antigen derived from lysate of GP78 strain of JE virus infected PS cells (prepared as described previously 7 in the presence of 10 μg/ml brefeldin An added during the stimulation and after surface staining with anti-CD4FITC, cells were fixed/permeabilized for 30 min using BD cytofix/cytoperm™ Buffer (BD Biosciences) and then washed with BD perm/wash buffer (BD Biosciences). Further antibodies anti-IFNγ-PE, anti-IL-4PE, anti-IL-17 PE were added for Th1, Th2, Th17detection respectively. Statistical Analysis: Statistical analysis was performed using GraphPad Prism 4 software (Graph Pad, NJ.U.S.A). Comparison of T cell subsets between patients with different disease outcome was made using the Mann-Whitney U test. 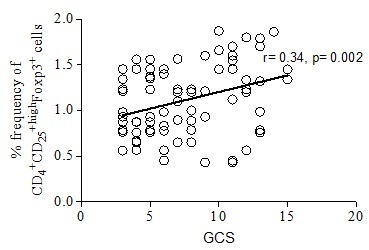 Correlation between the GCS score was calculated using Spearman's rank correlation coefficient. The level of statistical significance was defined as a P value <0.05. Demographic and Clinical Characteristic Japanese Encephalitis Patients: A total number of 544 pediatric AES cases were screened for Japanese Encephalitis. 80 cases were found to be JE positive following detection of JEV specific IgM antibody either in CSF or serum. Their demographic details are presented in Table 1. Healthy control group includes 64 age match pre-vaccinated seronegative children. Clinical Features of the Patients: Fever was usually high or moderate and predominated clinical feature. Convulsions, a neurological manifestation of illness were present in 73 cases (91.25%) Table 2 followed by altered sensorium and then behavioral abnormality. Retention of urine was the least common symptom (3.75%). Most patients have severe neurological manifestation, i.e. low GCS score was found in 50 ( 62.5% ) cases and moderate severity was found in 22 (27.5%) cases, and a GCS score of greater than 12 showed mild neurological manifestation and was found in 8 cases (10%). 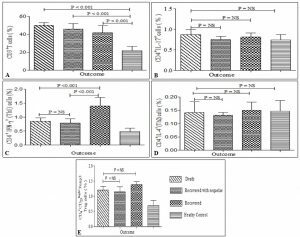 The outcome of Children with JE at the Time of Discharge: JE disease outcome of the pediatric patient at the time of discharge was recorded. Among the available 80 confirmed JE patients, 30(37.5%) recovered completely, while 38 (47.5%) cases had neurological sequelae at the time of discharge. 12 (15%) patient died in the hospital Table 3. FIG. 1: MEAN PERCENTAGE OF T CELL SUBSETS IN PATIENT WITH DIFFERENT OUTCOME. CD3 (a), CD4TH17 (b), CD4 Th1 cells (c), CD4Th2 cells (d) and CD4 % of CD4CD25highFoxp3 Treg cells (e) in patient with different outcome. i.e., death, Recovered with sequelae, Recovered, Healthy control. Co-relation between Different Lymphocytes and GCS Score: GCS score (indicates neurological manifestation) was also observe. A positive correlation was observed between GCS and Tregs cells (r=0.34 P= 0.002). No correlation was observed between the rest of the lymphocytes and GCS score. FIG. 2 CORRELATION BETWEEN GCS SCORE AND TREG. Positive correlation r= 0.34 and P = 0.002, calculated by Spearman's rank correlation coefficient. DISCUSSION: We have compared CD4+T cell subset among JE patients with different outcomes at the time of discharge, i.e. patient who died, a patient with sequelae, a patient who recovered. CD3, CD4th1, Treg cells mean percentage of found to be increased after infection when compare to the healthy control group, which is in agreement with a previous animal model study in which brain is infiltrating cells were identified during JEV infection, suggesting their role in during JEV infection 4. We have found CD4+IFNγ+ Th1 cells significantly higher in the recovered patients when compared to another group. Our results are consistent with a recently published study showing smaller IFN-gamma response was associated with poor outcome indicating a role for IFN-γ in recovery 8. 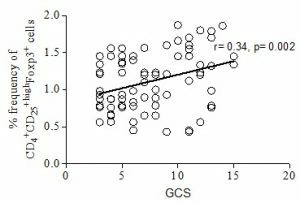 Correlation between different lymphocytes and GCS score (indicates neurological manifestation) was also observed. A positive correlation was observed between GCS and Tregs cells. No correlation was observed between the rest of the lymphocytes and GCS score. Regulatory T cells (Treg) are involved in regulating excessive immune responses. Being the regulator of immune responses, it is possible that these cells may have important roles in modulating CNS inflammation in viral encephalitis. Tregs were also shown to be involved in controlling the development of symptomatic West Nile encephalitis in both mouse and humans 9. Using a murine model of human immunodeficiency virus encephalitis (HIVE), a recent study showed excessive ingression of Tregs in the inflamed CNS when compared to non-inflamed peripheral tissues such as spleen and liver 10. In another study using HIVE, activated Tregs were shown to attenuate astrogliosis and microglial inflammation with concomitant neuroprotection, which was due to increased neurotrophic factors in brain 11. During JEV infection, neural stem/progenitor cells (NSPCs) in inflamed CNS, where there is excessive infiltration of activated T cells, may try to suppress the inflammatory activity by inducing conversion of activated T cells into CD4+CD25 + FOXP3 + Tregs 12. CONCLUSION: We conclude that CD4Th1 might be associated with recovery after JE infection. Treg cells expansion during JEV infection may lead to an improvement in neurological manifestation. A deeper understanding of role T cells subset in limiting or controlling JE infection would be helpful in developing improved vaccination and treatment strategies against Japanese encephalitis infection. FUNDING: This study is supported by the funding obtained from the Council of Scientific and Industrial Research, New Delhi, India. ACKNOWLEDGMENT: We thank Kushinagar District Hospital Staff for helping us in sample collection as well as for their technical help. We would also like to acknowledge Dr. S. K. Mandal for his help with statistical analysis. CONFLICT OF INTEREST: The authors declare that there is nothing to disclose. Campbell GL, Hills SL, Fischer M, Jacobson JA, Hoke CH, and Hombach JM: Estimated global incidence of Japanese encephalitis: a systematic review. Bulletin of the World Health Organization 2011; 89(10): 766-74. Organization WHO: WHO-recommended standards for surveillance of selected vaccine-preventable diseases. 2003. Kim JH, Patil AM, Choi JY, Kim SB, Uyangaa E and Hossain FMA: CCR5 ameliorates Japanese encephalitis via dictating the equilibrium of regulatory CD4+ Foxp3+ T and IL-17+ CD4+ Th17 cells. Journal of Neuroinflammation 2016; 13(1): 223. 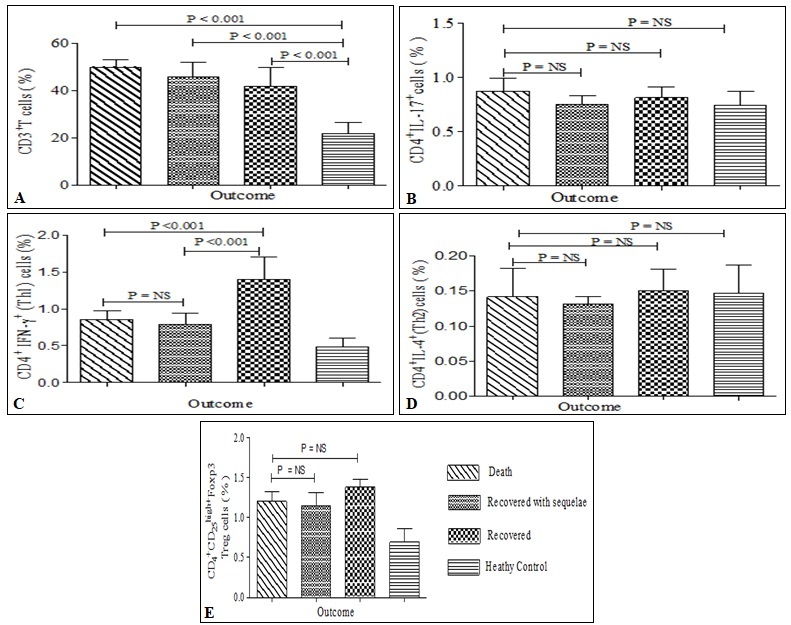 Shirai K, Hayasaka D, Kitaura K, Takasaki T, Morita K, and Suzuki R: Qualitative differences in brain-infiltrating T cells are associated with a fatal outcome in mice infected with Japanese encephalitis virus. Archives of Virology 2015; 160(3): 765-75. Biswas S, Ayachit V, Sapkal G, Mahamuni S and Gore M: Japanese encephalitis virus produces a CD4+ Th2 response and associated immunoprotection in an adoptive-transfer murine model. Journal of General Virology 2009; 90(4): 818-26. Larena M, Regner M, Lee E and Lobigs M: Pivotal role of antibody and subsidiary contribution of CD8+ T cells to recovery from infection in a murine model of Japanese encephalitis. Journal of Virology 2011; 85(11): 5446-55. Pyke AT, Phillips DA, Chuan TF and Smith GA: Sucrose density gradient centrifugation and cross-flow filtration methods for the production of arbovirus antigens in-activated by binary ethylenimine. BMC Micro 2004; 4: 3. Turtle L, Bali T, Buxton G, Chib S, Chan S and Soni M: Human T cell responses to Japanese encephalitis virus in health and disease Journal of Experimental Medicine 2016; 213(7): 1331-52. Lanteri MC, O’Brien KM, Purtha WE, Cameron MJ, Lund JM and Owen RE: Tregs control the development of symptomatic West Nile virus infection in humans and mice. 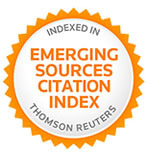 The Journal of Clinical Investigation 2009; 119(11): 3266. Gong N, Liu J, Reynolds AD, Gorantla S, Mosley RL and Gendelman HE: Brain ingress of regulatory T cells in a murine model of HIV-1 encephalitis. Journal of Neuroimmunology 2011; 230(1-2): 33-41. Liu J, Gong N, Huang X, Reynolds AD, Mosley RL and Gendelman HE: Neuromodulatory activities of CD4+ CD25+ regulatory T cells in a murine model of HIV-1-associated neurodegeneration. The Journal of Immunology 2009; 182(6): 3855-65. Nazmi A, Mohamed Arif I, Dutta K, Kundu K and Basu A: Neural stem/progenitor cells induce conversion of encephalitogenic T cells into CD4+-CD25+-FOXP3+ regulatory T cells. Viral Immunology 2014; 27(2): 48-59. Zia A, Rai MK, Agarwal V and Dhole TN: Role of CD4+T cell subsets in the determination of the clinical outcome of Japanese encephalitis infection. 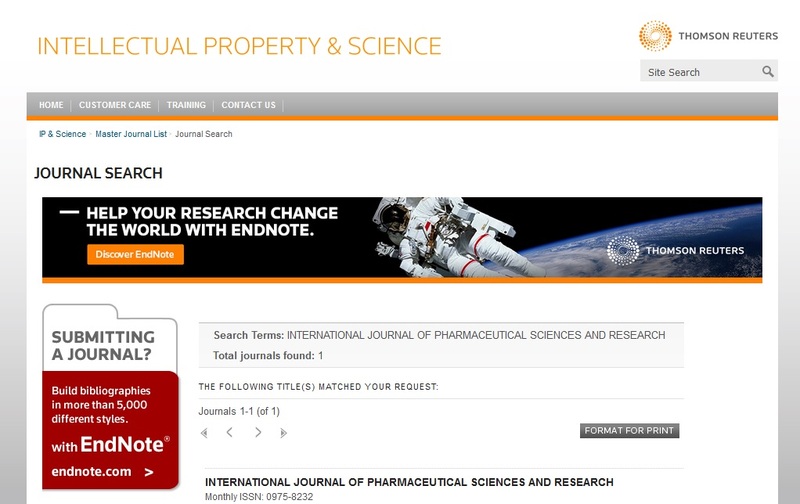 Int J Pharm Sci & Res 2019; 10(2): 742-46. doi: 10.13040/IJPSR.0975-8232.10(2).742-46. Authors Address: Department of Microbiology, Sanjay Gandhi Post Graduate Institute of Medical Sciences, Lucknow, Uttar Pradesh, India.